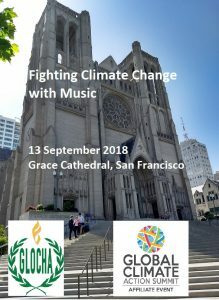 Therefore we are organizing in the context of the California Global Climate Action summit 2018 the „Youth Creating Global Change“ celebration at Grace Cathedral in San Francisco on 13th September 2018 7.00-9.00 PM PST . Your opportunity to get Your music heard by the world! 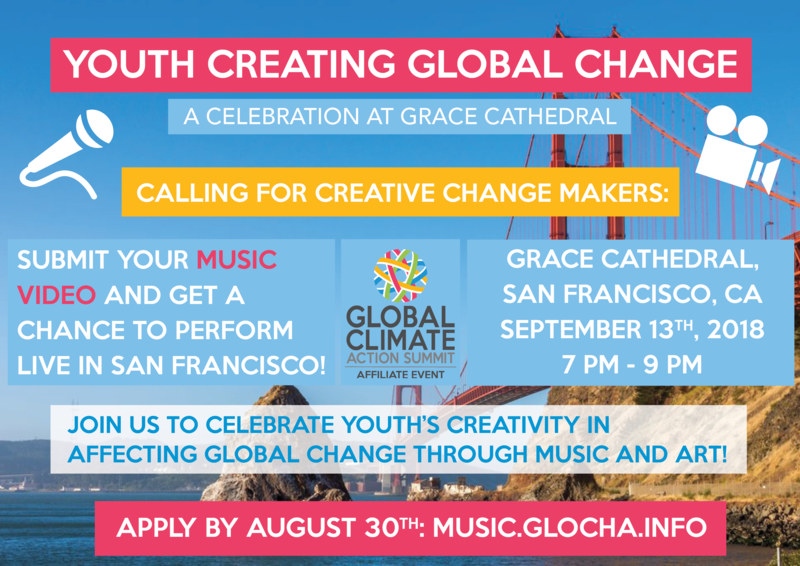 then we kindly invite You to apply to perform live at our event! Please fill in the following form (https://goo.gl/forms/ebl8uowq1KnC26or1) with information about you/Your band, Your story and a link to a video of one of Your recent performances and your agreement to provide us the permission from you and other potential copyright holders of the presented artwork, that we (the event organizers) are given the right to videorecord your performance and to use the recording live and on demand in all media. The event organizers will select between 3 and 5 artists/bands/groups and send them a notification by 1st of September with the offer to perform live at the 13th September event at Grace cathderal. The selection process will consider criteria like quality of the performance, attractiveness of the story of the song/the artists, carbon footprint of participation, etc. Note: The offer to perform at the event does not imply any financial responsibilities of the event organizer towards the performing artists. GYMC15 Voting Phase started – You can vote here! David bei GYMC15 Voting Phase started – You can vote here! Ana Maria bei GYMC15 Voting Phase started – You can vote here! WP-Admin bei GYMC15 Voting Phase started – You can vote here! Margaret Ouwehand bei GYMC15 Voting Phase started – You can vote here! David Peat bei GYMC15 Voting Phase started – You can vote here!